Smoulder Wolf to me stands out by far when it comes to candles. Masculine, powerful and captivating are just a few words to describe how amazing these two candles really are. I do love a good candle as some of you may have already read my previous posts on Diptyque candles here and most recently, my 'His and Hers' candles here for my blog's special Valentines Week! 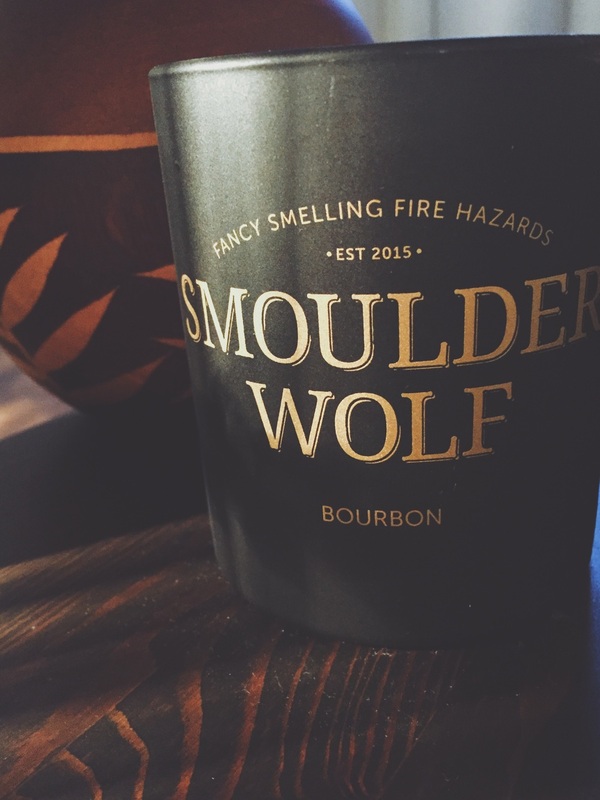 I'd been sent two candles from Smoulder Wolf which were the Bourbon and Coffee, both of which are just divine. I love how eye catching the design of the candle is and how well it features upon my shelf! When I'd initially seen that they had a candle which smelt like coffee, confusion went through my mind at first and I was very intrigued to catch a whiff of this as I felt this could either go two ways! Tacky, or genius. Thankfully, it was the latter! This candle when lit, creates the illusion that you've just stepped into your local coffee shop. It completely fills the room, and then some! The only downfall to this scent is that this can sometimes be a touch overpowering at times, so I would recommend burning this for around 40-50 minutes. Overall, a stunning candle with a bold punch. My favourite candle out of the two! The Bourbon candle just smells divine and oozes class. Powerful, yet not as bold as the Coffee candle although they both equally envelop the room with their scents. I would recommend burning this for up to one hour but make sure you trim the wick before lighting up to ensure that there is no black smoke left when blown out! Overall my favourite and one I would definitely favour out of the two! You can purchase the Coffee candle and the Bourbon candle online. Their other candle creation is their Leather one which can also be purchased online, I think I'm going to have to get this one next! Have you smelt these candles before? Which sounds more appealing to you out of the two? Let me know what you think as I'd love to hear from you!